I wanted to take this opportunity to invite everyone to check out the Personal Journeys Blog that was publicly unveiled and launched earlier today for my Digital Interactive Arts class at Emily Carr. Everyone was very interested in reading about the stories that people submitted to the art project and would like to extend my deepest thanks to everyone who submitted their stories. This is not the end of the project however, and I will be working with several faculty at school in pushing the project further over the summer. For those of you who wanted to participate, but haven’t had a chance to write up your stories, don’t fret because you still have the chance to send them in and I will put them up on the blog as they arrive. Furthermore, two other avenues for the project that I would like to explore are to setup a venue at the Athlete’s Village for 2010 Winter Olympics, which I had previously mentioned; but the most important one to my heart is to contact the BC Cancer Foundation and see if they would like to work together in recording and documenting the Journeys of Cancer patients currently going through radiation treatment and chemotherapy as well as the stories from their families. I will be contacting them tomorrow to look into the feasibility of this project as well as starting to piece together a video which recounts the details of My Personal Journey, which I wrote about January 28th, 1994, the day my mother died from ovarian cancer at the BC Cancer Clinic in Vancouver. I will keep you guys posted on how both of those progress. Read through the Journeys, click on the links to view the maps and also look at the Visual Journeys section of the blog to see other outcomes that I developed as well. I wanted to take this opportunity to once again thank you all for participating in the Personal Journeys art project. The stories that I received from have been heartwarming, inspiring and tragic at the same time. For those of you who have not submitted their stories yet, there is still time to send it in as I am now in the process of compiling the information together. Furthermore, if anyone in the group has reservations about me publishing their names in the final piece, please let me know and I will post your story as anonymous. To that end, the final piece will be presented to the public a month from now and will be displayed in a blog that I am creating, but I do not see that as the end of this process. My mind is simply on fire with ideas about how to push the envelope of this project further and further. We here at Emily Carr and the entire city for that matter on the verge of a once in a lifetime opportunity because one year from now, the eyes of the entire world will be focused on Vancouver for 16 straight days when the 2010 Winter Olympics begin. What if we went to the Vancouver Olympic Committee and setup within the athlete’s village to record and document the Personal Journeys that each athlete had to go through in order to make it here to Vancouver. What a wonderful gift that would be to share not only within the village, but to the world as a whole. 1a. Create a blog to document, list and display incoming Journey stories along with the associated graphical line plots – to be then presented to the class and to outside viewers who are invited to participate virtually. 1b. Enlarge and print a few selected Journey stories and graphical line plots and put them on display for the class when the project is presented and possibly the school gallery at the annual student exhibition in the spring. 2a. Actively seek Emily Carr participation from an administrative level to fund, market or otherwise advance the project to greater reception and accessibility. 2b. Form a team of 3 to 4 dedicated Emily Carr students to go on a road trip to recreate select Journeys in order to document them and in the process request school administration to setup a self-directed co-op program so participating students can get school credits. Outside corporate sponsors in the region could be located to help fund the endeavour and the project scope can be expanded to create a documentary film, book, website or other type of media device. 2c. This team of students would interview the original Journey authors and document the sights, encounters, people, places and otherwise meaningful moments along the Journey. In addition, this team of student artists would cover a wide range of talents and disciplines in order to provide a greater canvas to document the process and scope of the Journeys (ie: Photographer, Videographer, Musician, Writer, Digital Artist…) Each member would add their own unique flavour to the project and allow for inspiration from the Journey itself to drive their own personal art and life experience gained as a result. 2d. Select Journey stories and graphical line plots can be enlarged, printed and put on display in major art galleries, providing greater exposure to the original and subsequent documentary projects. Journey authors could be invited to give guest lectures on their respective Journeys and input kiosks could be installed in galleries to allow viewers to enter their own Journeys and graphical line plots into the database as well, after being inspired from reading of the Journeys of others. 3a. Pitch the Google Journeys idea directly to Google themselves – seeing as though they have a tremendous budget to work from and http://maps.google.com/ only provides a singular and not immediately meaningful attachment to the graphical line segment produced by the mapping software (ie: it creates a graphical representation of a Trip, not a Journey and certainly not one that is easily linked to others) – whereas if both Google and we as artists could create an immense database of Collective Journeys for people to read through and visualize graphically and tied into other similarly meaningful Journeys. 3b. Google Journeys could become a living and breathing Artwork existing purely on a virtual level and being on display to people around the world 24/7 while constantly being added to and upgraded. Participants would continue to add their own Journeys to the existing project whole and the graphical line would get bigger and bigger. Visual representation of the immense Collective of Journeys could be displayed in real-time as either 2d or 3d display. 3c. Visitors to the Google Journeys website could browse through the database to look up individual Journeys or run searches based on input parameters. As mentioned above, the tree branch analogy is a fitting one, seeing as how jagged and random the waypoints turn the graphical line plot every which way. Individual or select group Journeys could display as being colour coded and then zoomed in on in the 3d display of the Great Tree Branch, where the viewer could then click on and then bring up the author’s individual Journey story. 3d. Similar to a blog setup, visitors could then leave comments for the Journey’s original author and a global dialog could be achieved along with new friendships and greater understanding for one another. Authors and visitors alike could formulate new Journey plans amongst themselves – Shared databases between Google Journeys and Google Video could be extrapolated and linked in order to provide video responses to individual Journeys – the project could become viral in its outcome and scope. 3e. The inherent search engine and search results would provide local companies, hotels, and travel services to be immediately directed to those particular areas covered in the Journey display, allowing ease of use in planning not just a regular trip, but a Journey of your own. There you go – these are the thoughts racing through my mind on how to expand this project further so let me know what you think of these options and let’s see how far we can push this because the sky is limit! Facebook turns 5 — but can it survive? (CNN) — A Web site started by a student as a way of staying in touch with friends celebrated its fifth birthday Wednesday as a billion-dollar business and a global phenomenon. Around 15 million users update their statuses on Facebook daily. Mark Zuckerberg was 19 when he launched Facebook from a Harvard dorm in 2004. Within 24 hours, more than 1,000 of his Harvard classmates had signed up for the social-networking site and one month later half of those on campus had a profile. Five years on, the Web site claims more than 150 million users worldwide while Zuckerberg, now 24, was named the youngest billionaire on the planet — with an estimated fortune of $1.5 billion — last year by Forbes magazine. Along with sites such as MySpace and Bebo, Facebook has also been credited with bringing social networking into the mainstream, with politicians, businesses and celebrities jumping on the bandwagon. According to Facebook figures, around 15 million users update their statuses daily. More than 850 million photos are added to the site each month while the average user has 120 friends. Meanwhile, Web sites such as Facebook were widely credited with helping Barack Obama secure victory in last year’s U.S. presidential election by helping him connect via the Internet with younger, previously disengaged voters. In a new Facebook first, the Web site featured at last week’s World Economic Forum in Davos with users contributing to live discussions and polls that were flashed onto big screens during sessions with world leaders. Yet questions still remain about the finances behind Facebook’s remarkable expansion. The company has attracted more than $200 million in investment from venture capitalists while in 2006 it rejected a reputed $1 billion bid from Yahoo! In 2007 Microsoft paid $250 million for a 1.6 percent share, a figure that gave Facebook a total projected value of some $15 billion. But with the global financial crisis hitting Web advertising — Facebook’s core revenue stream — those sort of figures now appear to belong to a bygone age. “What Facebook isn’t yet is a slam-dunk success,” said Adam Lashinsky of Fortune magazine last month. “It is selling advertising, it is bringing in revenue but it’s not wildly profitable even if it is profitable at all. Yet in an industry prone to short term fads and rapid evolution, Mark Zuckerberg said Wednesday he remained committed to making sure that Facebook remained as relevant in the future. If you have any questions, please contact warning@facebook.com from your login email address. Whereas by sending out Friend Requests to strangers (albeit fellow Emily Carr students, allumni and staff), I wanted to create a rabbit hole for people to jump down into – think of Alice in Wonderland – and I wanted to have active participants. I want people to take a chance and peel back the layers to see what is inside not only this project, but what is inside themselves as well and to tell me what they find by writing down and mapping out their Personal Journey. Well, I guess the automated powers that be at Facebook have blocked me from sending out anymore Friend Requests to fellow Emily Carr University students/faculty/associates linked in to the school groups that can be found when you do a search. I can understand why they have such automated features, but it’s frustrating to be lopped into the same category as spammers, phishers or other types of crooks. Because of this, I am asking for your help. If you feel that this project has merit and is worth the effort to bring in others to tell their stories as well, I would like to ask you to invite your friends to join the event. The future of this project is now in your hands as I cannot do it without you. Please help me in seeing this project become a reality because it means so much to me and I know that it means a great deal to you as well. The lyrics are sung in Icelandic, yet one need not know what the words mean in order to interpret the value and depth that they and the imagery convey. I actually don’t want to know what the lyrics translate to in English because it would take away the beauty and serenity that I found interpreting it myself. 1. Watch the full video without pause to understand the essence of the piece. 2. Read through my shot-by-shot written breakdown. 3. Watch the video again and take in a new personal understanding of the imagery. 4. Rewind and go back to individual shots and if you feel inspired, write down what they mean to you and compare them to mine. 5. Smile and feel a sense of peace = All will be OK. I was just recently blocked from sending friend requests on Facebook. As a result of that, I felt it would be prudent that I send you an email to let you know that I am not some dirty old man trying to prey on young children, nor am I a nefarious crook trying to swindle little old ladies out of their life savings. I understand that you guys have to have set TOS standards and I know why I was tacked onto the list of possible spammers/crooks by sending friend requests. I have been in your shoes as I have worked many customer service gigs, most importantly when I worked for eBay in their investigations department and had to respond to complaints sent in my members about other members, with spam being one of the biggest issues reported. That being said however, I am just an aspiring art student struck by inspiration and in the process of trying to invite people to join my Art Project as I feel that it is a great event to participate in. I am not trying to sell anything, I am just asking people to share their stories with me and am sending Friend Requests to my fellow art students and art enthusiasts (people who would want to participate in such an event). I’m not asking for much here, but please check out my event page and see for yourself “Personal Journeys – Help John with his Art Project.” I’m not a bad guy, I’m just trying to create a beautiful piece of art and to allow people to tell others their story. Please let me know where I can go from here – I need your help. Police in southern New Zealand nabbed a would-be burglar after they posted security camera images of him trying to break into a safe on the popular social networking site, Facebook. 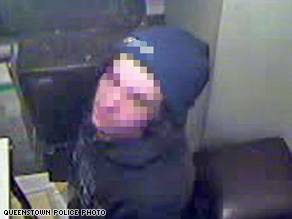 Having removed his balaclava after his efforts made him hot, the would-be burglar looks up at a security camera. The Queenstown police are calling it their first Facebook arrest. The police department created its online presence on the site just two months ago, said Constable Sean Drader. “It’s pretty popular, isn’t it, this site?” Drader told CNN Wednesday, surprised at the quick success. The 21-year-old masked man allegedly broke into a local pub through a roof early Monday morning and spent considerable time trying to crack open a safe using an angle grinder. Unable to break open the safe, the man gave up and got ready to leave, Drader said. “He looks around to see if he’s forgotten anything, and he looks up right at the camera. It was rather silly. We got a good look,” he said. The police department posted the surveillance camera photos on its Facebook page. By the next day, the man was in custody, fingered by viewers who recognized him from the images on the site, and from TV segments on the Facebook posting. Police did not release the suspect’s name, but said the Queenstown native is charged with two counts of burglary. 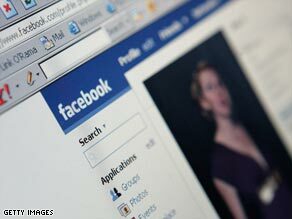 Facebook, the Web’s most popular social networking site, allows users to create personal profiles. They can then connect with one another, upload photos and share links. The site boasts more than 90 million active users. In November, Facebook helped a seafood restaurant owner in Melbourne identify five customers who dined on oysters, trout and expensive wine and then bolted without paying the US $323 bill. According to media reports, the owner remembered one of the diners asking about a former waitress. The waitress suggested the restaurateur look through her friend’s list on Facebook. A quick scroll later, the owner spotted one of the bill dodgers.